Riverland is "Queen of the King's River"
Riverland Resort is located on the scenic Kings River just south of Kingsburg. 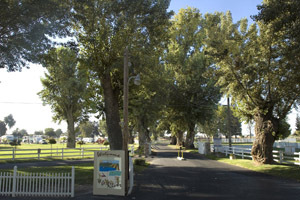 Riverland is the Queen of the Kings River and California's Central Valley's finest RV resort. 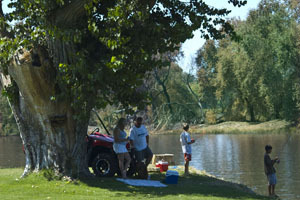 Riverland is spread out over 43 acres of recreational fun. A perfect place to get away. Kings River allows enjoyment of all your favorite water sports. Riverland offers a wide variety of amenities including a pool, jacuzzi, basketball, and volley ball courts, a private fishing lake, horseshoes, club house, laundry facility, paved walking paths, and much, more. Check out our on-site bar & grill, Bullfrogs! Riverland has been known to provide it's guest with an unforgettable experience, whether it be a place to take the family fishing, or a place enjoy all your favorite water sports, or a place where you can turn up the radio, listen to the music, kick back and relax while over looking the beautiful Kings River. Whatever the experience you desire we hope we can fulfill it for you. Directions: HWY 99 to exit 109, turn west at the exit. Riverland is on the west side of the freeway. Road will dead end at Riverland. Easy Freeway access.